10 min walk from Tenshoji. 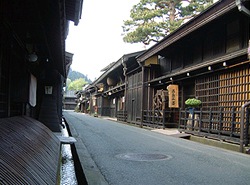 It is in the middle of Sanmachi where Edo period houses remain. It is castle town with latticed bay windows standing in a row.This district was designated an area of important traditional buildings by the Japanese Govement. About 3km awayr from Tenshoji. It is an open air museum exhibiting farmhouses. 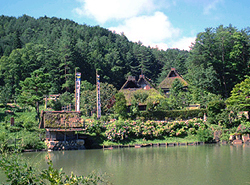 There are lots of gassho-zukuri houses with thatched roofs, which moved here from Shirakawa-go region. All exhibited buildings are carefully preserved, and are displayed utensils, too.